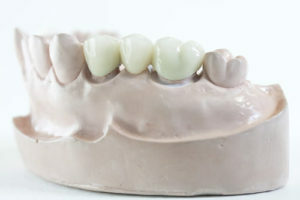 A dental bridge is a simple and fast way to replace a missing tooth, which looks completely natural. A dental bridge is made to give teeth back their natural look and feel without an unsightly gap, or to give back more teeth to chew on. It’s made by using the teeth either side of the missing tooth to act as structural support; a replacement tooth is suspended between them. It is fixed, meaning doesn’t come in and out of your mouth like a denture. If the teeth on either side of the missing tooth are not strong enough, to replace the missing tooth a dental implant may be considered.